Going to put in one more plug for the Bayou Segnette State Park, which is a great place to base yourself to see New Orleans. Our next morning was scheduled to rain again so we decided to go for another inside day in a museum. 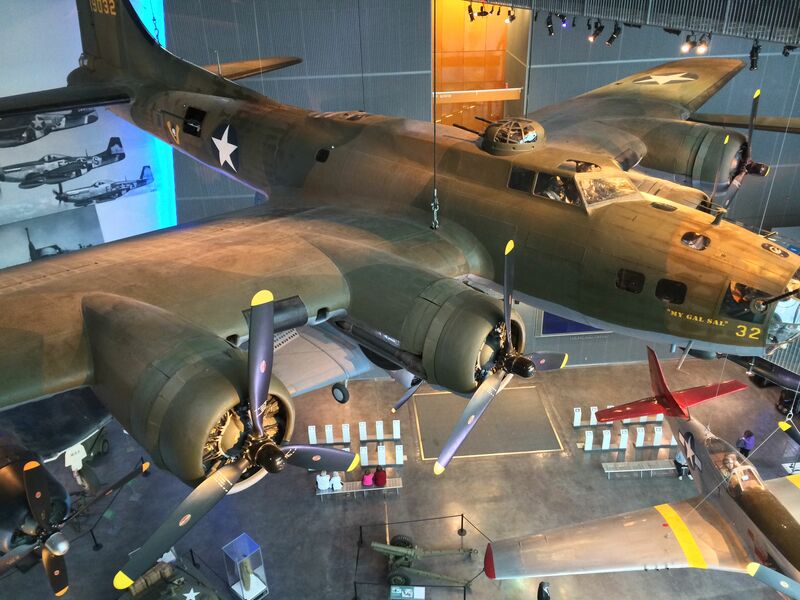 We had heard great things about the National World War II Museum in New Orleans. It used to be called the D-Day Museum. First question you might ask is “Why is the NATIONAL museum for this war in New Orleans?” Well, let me tell you. The Higgins Boat, the boat that made D-Day possible, that classic shot of all the troops pouring out of the front of those boats that landed right on the beach was designed and built right here in Louisiana. It was based on designs used in the bayous. Never knew that, now did you? The second question you might ask is, “do you think it wise to take two children you often protect from scary movies to a museum that is dedicated to WAR?” Yeah, that’s a question we didn’t ask ourselves. I’m really not sure why we didn’t think of that. The kids learned a lot about war, with vivid, moving pictures of the horrors of war. I’ll come back to that in a minute. Let’s talk about the museum first. It’s an amazing museum. The guidebooks say allow 2-3 hours. I say double or triple that. We got kicked out at closing time – which might have been bad because it talked about the end of the war and some of the good and bad that resulted. I also want to point out that this is a VERY American centric museum. This is the war told from our perspective. We barely mention the Allies! The museum started on the ‘home front’ and showed the state of the country before the war. How few people we had in our military compared to the other world powers. That was one of my 3 takeaways – how FAST the build up was. The immense enlisting, training, deploying, feeding, bedding, treating, dealing with the death, the building of factories – all that is just overwhelming. My other take away was the sacrifices made on the home front, the rationing, the saving, the pain were so much greater than anything we have experienced for any war since. This is a war that changed the entire fabric of our country. The last take away was 650 million people. That’s the number of people that died worldwide in this war. There were small booths throughout where you could hear amazing personal stories of everyday people talk about some aspect of the war – from women working in the factories, to men talking about the draft, to memories about the various battles that they fought in. Think Story Corps if you listen to NPR. They were small moments and very personal and intimate. That was very powerful for me. Then there were the large moments – the guns, the uniforms, the ACTUAL planes you could get eye level with. There was an amazing movie narrated by Tom Hanks that was big and moving and emotional. In summary, it’s a great museum. Back to whether we damaged our kids. Now that it has been a couple of days I just interviewed them about their views or memories of the museum. The day of the visit they were just blown away by the actual museum – buttons to push, screens to watch, huge planes to ogle. Now, they still think it was an amazingly well done museum. They aren’t sure that other kids their age should experience the “bad things” that they saw in the movies and the exhibits. Carter thinks that maybe 11 year olds should go (a year older than himself). I don’t think they are scarred in any way. In a way, I’m glad they saw it all, but I’m not sure with a time machine whether I would take them again at this age. I think they learned about war, but the one thing I will give the museum overwhelming credit for is that it wasn’t just the heroes and the victories and the glamour and Hollywood version that was presented. The museum was clear on the fact that war is hell, but I think it was also shown a picture of WHY we had to fight that war. So – one blow against our children’s innocence on Day 1 of our trip to New Orleans. A plane that went down in Greenland that was recovered after the war. You did not damage them. Just showed how important freedom is and how our country cannot ever let any person or another country take it away. Millions of people died for the rights that are provided us in our constitution. Since you brought it up, I don’t think you have damaged them by exposing Carter and Bennett to war. These boys are smart cookies. I think the images of real war time experiences will stay with them. How this images affect their future development? who can say. but at least they have seen it is not gomer pyle, or similar wrapped up in a bow and all tidied up at the end type of a story. I remember lines of middle school children at the United States Holocaust Memorial Museum in D.C. and was so impressed that they were there to visit and learn about this terrible event in our human history. Your children might play significant roles in their adult lives in mitigating, preventing, or defending our country from such atrocities based on the memories of what they learned as children. I’m sure the WW II museum was an important experience for the boys–one that will likely have a positive & lasting impact on them! Wow! I can’t believe that you took your children to a war museum! Especially when your children where that young! How detailed was the paintings of slide shows? How many airplanes where there? The class misses you guys see you in July!